I really liked the format of the course. As an American, I have taken other online courses before and did not really get any feedback from the instructor other than a grade for a paper I had to write. The video tutorials were very helpful in learning the program. I liked that the learning was scaffolded. We started out just by doodling, then went to replicating files off videos, then finally we created files on our own. ​​GeoGebra is free mathematics software, dynamically connecting concepts across numerous topics, 6-12. This online course enables high school mathematics teachers to become proficient in the use of (computer-based) GeoGebra and to experience its transformative power. Participants become more able to engage their students and more effective at enabling them to understand the mathematics presented. The course also provides examples of how GeoGebra can be used to create formative assessment opportunities and to help teachers provide feedback to students. 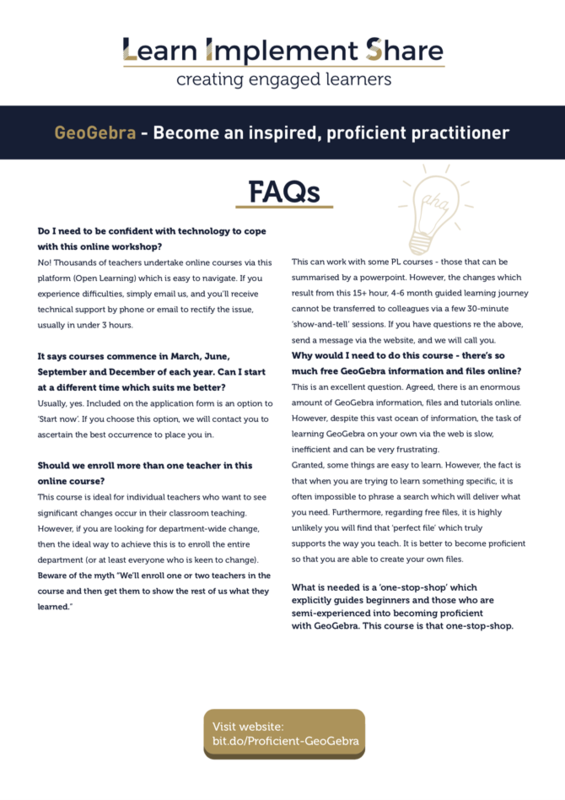 Becoming proficient with the use of GeoGebra is usually a challenging task, especially when learning via internet searches and/or face-to-face workshops. However, this online course provides an efficient, easy and enjoyable pathway due to the course being a fully facilitated, 15-hours-over-16-weeks, guided learning journey. Participants have 24/7 access to this self-paced, online experience. For those who completed the original, this course is a very significant upgrade to the one called 'Dynamic GeoGebra and Algebra with GeoGebra'. Over 50 sequenced, quality GeoGebra files are demonstrated via expert videos. report back on their implementation experiences. Implementations occur from as early as topic two of the eight-topic course. Teachers have hectic lives and sometimes things get in the way of completing a course in the allocated time. Be assured that if this happens to you, and you are keen to complete, we will do enable you to do so. Geometry, graphing, calculus, measurement, statistics, dynamic formula demonstrations, spreadsheet, inquiry-based files, student-centred investigations, examples of past participant submissions and more. Course delivery: This is a self-paced course. Each occurrence runs for 16 weeks. Participants are welcomed to the course and 'meet' the presenter/facilitator. The course requirements are explained. Participants introduce themselves via an introductory post. Basic GeoGebra skills development. Basic skills are taught in context. A working GeoGebra file is demonstrated via video. Participants manipulate the file on their computer. Participants are then guided through the steps and build the file. This process is repeated for approximately 10 files. At the conclusion of building this first series of files, participants have learnt a significant number of skills with GeoGebra. This session builds upon the initial skills gained in Session Two and uses the same learning model. Files covered include reflected and rotated polygons, locus of a parabola, tangent to function, integration, use of sliders. Importantly, the ability to create dynamic text within GeoGebra files is introduced. This session introduces important new skills and techniques which increase the power of GeoGebra files, including snapping and deleting points, the bisector tools, the circle tools, the measure tools and the hide-show tool. What is conceptual understanding? Strategies to promote conceptual understanding in students - use of questioning, meta-cognition, creating a need to learn. Applying these conceptual teaching strategies when creating GeoGebra files. When creating videos for online units participants need to understand video file types, the advantages of compressing videos and Now that most of the fundamental GeoGebra skills have been covered, participants are guided through files which combine various skills, as well as being introduced to some new ones. Files and skills include explorations of polygons, orthocentre of a triangle, a circumscribed circle, the median-centroid investigation. Dynamic Geometry really comes alive with Circle Geometry, and Circle Geometry is what this session is all about. Participants will be able to easily represent any and all of the circle theorems by the end of this session. The course completion process including accreditation information, a short survey, staying in touch and options for continued access. Yes, it is - it is a 15 hours NESA accredited course designed for secondary or middle school teachers who are keen to supplement their classroom teaching with quality, online components. Note that if you are from NSW and spend more than 15 hours, you may use the extra time as teacher-identified hours. For those in NSW, this course will contribute 15 hours of NESA Registered PD addressing 3.2.2, 3.4.2, 6.3.2, and 6.4.2 from the Australian Proficient Teacher Accreditation in NSW. Why would I need to do this course - there’s so much free information online about how to use GeoGebra. It is true there is an enormous amount of freely available information about GeoGebra and you can certainly learn how to use GeoGebra from searching the web. However, there are two issues when learning GeoGebra off the web 1) You don't know what you don't know and 2) many skills/procedures simply cannot be searched because you have no idea what the skills/procedures are called. The fact that the course is a 'one-stop-shop' to learn GeoGebra through replicating 50+ useful files, learning the skills progressively and then to create your own files and receive files from others, then implement all this with students makes this a very efficient and comprehensive way to become proficient with GeoGebra. What happens if I don't finish my course within the four months? A requirement of the course is to implement strategies from the course with students and to report on those implementation experiences. Click the button below to access some example implementation reports. ​Another requirement of the course is for participants to create and share some GeoGebra files of their own. In order to visually display a selection of these files gifs of some files have been created. Click the below to gain an idea of the sorts of files that participants create - they are worth checking out. The original GeoGebra file at right was created by Pamela McGillivray​. 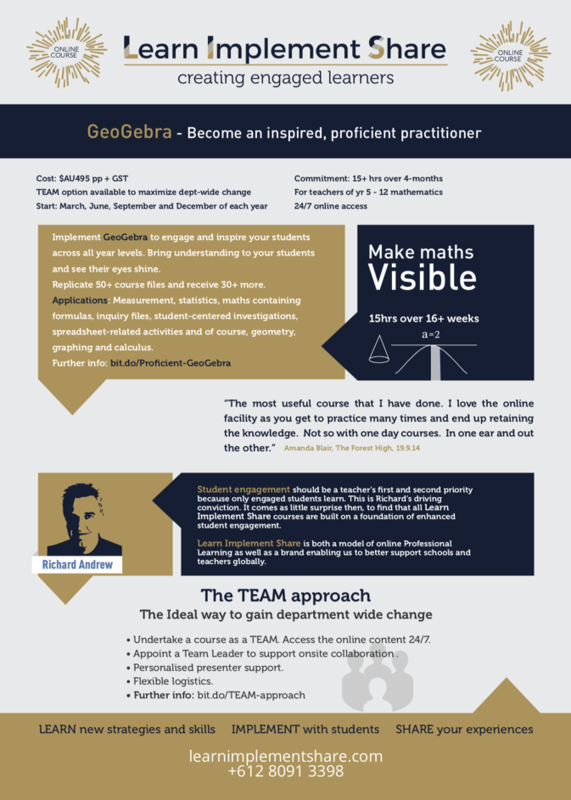 ​Completing GeoGebra - Become a proficient, inspired practitioner (online, Yrs 7-12) will contribute 15 hours of QTC Registered PD addressing 2.5.2, 6.2.2 and 6.3.2 from the Australian Professional Standards for Teachers towards maintaining Proficient Teacher Accreditation in NSW. The course was awesome! Geogebra is an amazing teaching and learning tool. Easy to follow video tutorials. It was great to share resources and get feedback on your own activities. I am definitely inspired to use Geogebra more often in the classroom. I loved the extremely user-friendly Open Learning site used for the course and the speedy replies you gave me. Richard, these were much appreciated. Thanks, heaps!